“The home that you’re in” is in art display. “Give a flower free love” picture book that was published in July 2016. It’s main message is “a gift from heaven”. In this art display, main hero “Heaven” is floating and jumping inside it’s nest, looming in front of the display or giving flowers as gifts. The picture book was adapted as a video installation. The animation of the hero “Heaven”, is projected on hologram display. “Heaven” is floating in the air, getting closer to the viewer or fading out into the air. It expresses “A gift from heaven” concept - “impermanence: mono no aware”. 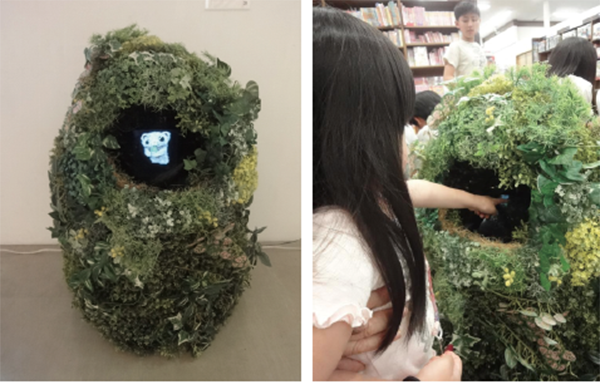 It was exhibited with commentary and design explanation in Ginza Steps Gallery in August 2016 as part of “Picture book time” exhibition. This work has also been used as a promotional window in book stores.